We are so excited to release a brand-new set of tools to RepairQ that will positively change the way you manage your business’s sales opportunities. With 1.15, RepairQ will offer shop owners a powerful CRM-inspired toolkit to create, track, and convert sales opportunities into happy, loyal customers. This release will be one of several to add new tools to what we’re simply calling our Opportunities Management Suite. Tracking relationships is essential in developing and maintaining your sales process. 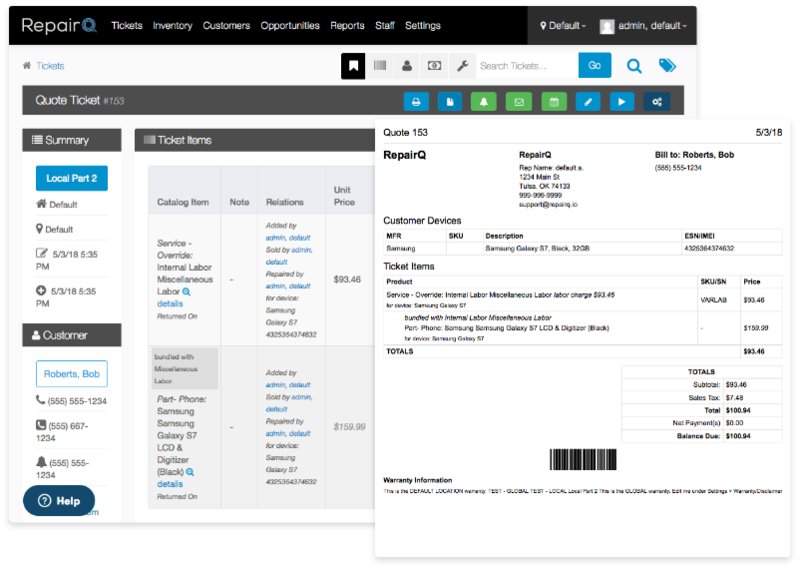 In the past, RepairQ users could only track one or two structured types of relationships, like a Customer. Now with Contacts, you will be able to create and track a whole new type of relationship, assign custom tags to them (like lead or prospect), attach quotes and appointments to them, and convert them to a Customer after their first sale. Contacts, just like Customers, can be searched, attached, tracked, and reported on. Many repair and retail sales start with a simple Quote in-person, over the phone, or via email. Now, in RepairQ Opportunities, you can capture those Quotes, share them, track, and convert them into tickets after they are accepted. Converting a Quote to a working ticket is a one-click process; inventory stock is pulled at the time of conversion. Quotes can have their own workflows, leveraging the ticket status system to track progress, and the automated notification can be just for Quotes. Many walk-in retailers are pushing to create more convenient and premium experiences for their customers, including reserving time to meet them. Now in Opportunities, you can create, track, manage, and check-in Appointments for your Contacts and Customers. Appointments are more than just time blocked on a schedule. Tracking Appointments as an Opportunity allows you to note who is coming in, what type of transaction they are interested in, device and diagnostic information, additional notes, and which staff member they’re assigned to. 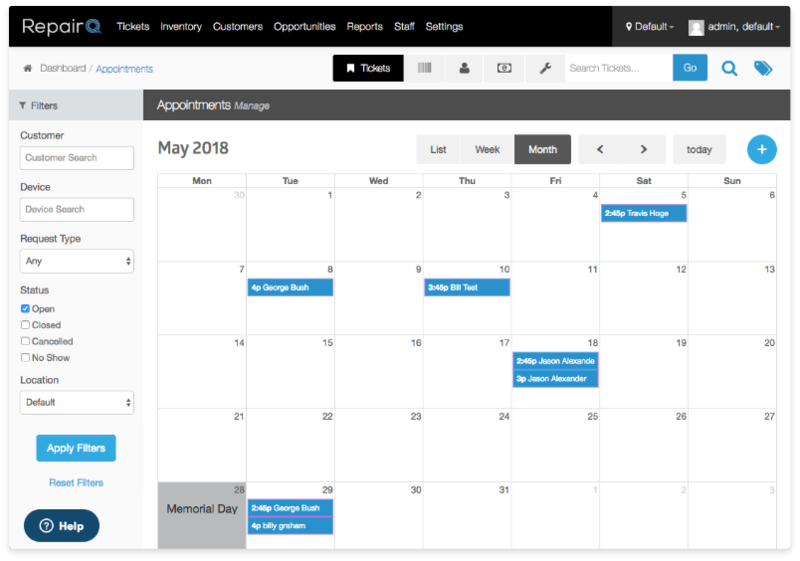 Manage your Appointment program health by tracking your upcoming Appointments, ones that show up to your shop, and those that never made it. This is just the beginning of a series of powerful tools planned for Opportunities. As a teaser, here are a few additions that we’re already working on for the following release. Sometimes an Opportunity simply starts with a question in email or over the phone. While less structured than a Quote or Appointment, capturing who, what, and when is no less important. Soon, Inquiries will give these Opportunity types a new place to be recorded and tracked. Inquiries will be linkable to Contacts and convertible to Quotes, Appointments, and Sales, helping to expand your ability to track your relationships throughout the sales process. RepairQ’s customer service companion app, Qsite™, will be getting a major facelift over the next few releases! Initially released to support customer repair ticket tracking, Qsite will be expanded to include a range of Opportunities tools that you can extend to the web, including capturing Inquiries and scheduling Appointments online.